The new license plates are obviously mierda. 1. A local or geographic fixture (i.e. The Kuwait Towers – if that is unacceptable a drawing of a Hubbly-Bubbly will suffice; if that is unacceptable then a picture of a dead horse). 2. Decent Font (and it would help to have the English word: “Kuwait” in BOLD as well) and a tag line as well, you know how Florida has “Sunshine State,” maybe we should have something like “Land of Broken Promises” or “Go With The Flow” under Kuwait. 3. One set of numbers – easier to remember so we can report that turd in the Hummer who almost ran over the senior citizen exiting Marina Crescent’s Johnny Rockets. Amazing. All that effort and the result is a plate that manages to be less attractive than both Syria’s and Iraq’s. What a pity about the tag line. “Cuckoo for Kuwait”; “Kuwait: waiting for you”; the delightfully bad puns are endless. 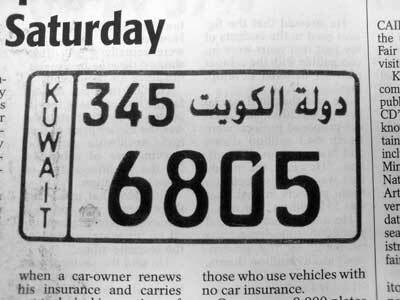 As for the country name, at least they could have gone 21st c and written it Q8. 10) Vacation in Kuwait, and feel better about your home country. 6) Taxes? … We don’t need no stinking taxes. 3) Kuwait…But its a dry heat!